Rol, Myxo, TG, Darky circa 1982. I was making my way through the Townsville airport terminal, when I saw a very small boy, probably no older than six or seven sporting a magnificent mullet. The hair on top of the boy’s head was closely cropped, but the locks trailed down between his shoulder blades like an arrow. “Evidently, Benjamin Franklin thought it was pretty cool,” I replied. She got me in one.“Yeah, but he was bald anyway,” she said. This same undergraduate at the University of Queensland followed up with a rhetorical uppercut when she said “It’s like that Down Trou stuff, you used to do when you were at College … It is so 1980s”. My daughter had to accept that even at her more refined residential college, there were some scrofulous youth who would perform the Down Trou at any given opportunity. And why wouldn’t they. I have no idea who invented the mullet, but I do remember a time when it was not unusual. I was working in the public service in the 1980s. It was a time of dress shorts and walk socks, of short-sleeved shirts and of very wide ties. It was the time of bank-Johnny chic. One day one of my colleagues walked in with the crown of his head buzz sawed down with a number two comb just below the ears but down his back flowed a mane of black curling hair. He flounced into the middle of the tea room and performed a pirouette. I grant you, he was top shelf, he was wearing flared long trousers and a body shirt. He announced loudly, that the Australian cricketer Wayne Phillips’s haircut “was deadly, eh” and he looked “just like him”. Now that I come to think of it so many cricketers sported mullets, Mark Waugh, Dizzy Gillespie and even Sir Ian Botham. The mullet is now reduced to part of the bogan identikit but the Down Trou is another matter. It is not often that you can look back upon some social phenomena and confidently claim to have some knowledge of how it started. For those of you who are ignorant of such things, the Down Trou is still performed whenever ‘Eagle Rock’ by Daddy Cool is played. It involves gentlemen lowering their trousers and linking arms Zorba the Greek style, bellowing the lyrics of the ‘Eagle Rock’ (as best they can remember) shuffling from left to right. It is absolutely necessary to have under one’s trousers a loud pair of boxer shorts know as Down Trou Pants. For those who would eschew the Down Trou as sexist I can assure you that ladies are not precluded … but generally refrain (difficult to do it in a ballgown) and the boxers mess with the undie line (so I am told). It is an institution of Union College and, soon after, the University of Queensland. I was thereabouts when it started, but let me be utterly clear… it was not my idea, and I had no part in the start of the Down Trou. I have a vague and fading memory of how it started which may be the subject of correction (TG White enter stage right). In the early 1980s, Canterbury clothing bought out rugby shorts with pockets. They became quite fashionable on campus, they were comfortable and allowed one to carry keys and wallet and worked with thongs and a mullet haircut. They were however reasonably expensive. Somebody, organised through their mother to make copies of the shorts. Before long, the shorts were being produced on nursery curtain material and inevitably expanded in size and vivid colour. 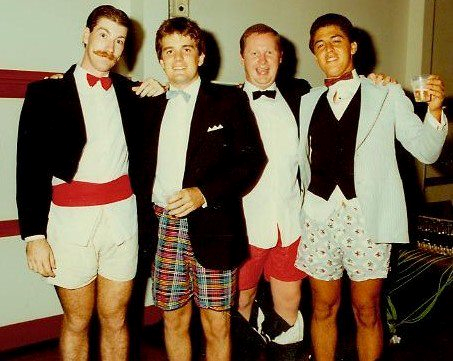 Evidently at a College Ball, a lad who shall remain nameless was wearing the shorts under his dinner suit trousers and for some reason lost in time when ‘Eagle Rock’ was played dropped his trousers. Why would an adult drop his dacks in public? It is hard to say, doubtless some would theorise that is was part of a tribal bonding. My vague recollection is the blokes who initially did it were without girlfriends … Utterly unlovable. Perhaps it was the dateless and desperate putting on the hail light? Maybe it was just a bit of fun, who knows? Before long, the practice had developed whereby whenever ‘Eagle Rock’ was played the gentlemen would gather in a circle arms locked with a trousers around their ankles. There is a fierce ongoing debate as to where this practice first started. While some are adamant that it is a born at Union College, the alumni St John’s dispute the claim (they bloody would). Initially, it was known as the “chaps’ dance”, but later took on the term ‘Down Trou’. The DownTrou is not limited to UQ functions… just ask The Handicapper about her wedding! Last July, I was at the Union Re-Union Ball, the powers that be, knowing their enemy had prepared and a fatwah was issued against ‘Eagle Rock’. When polite enquiries were made of the DJ it was made very clear that ‘Eagle Rock’ was not to be played. Clearly the straiteners had taken over. It was the subject of grumbling resentment: “How can they?”, “Wouldn’t have happened in our day!”, “Wowser bastards”, “treating us like bloody kids” and so on. The night was fun and full of emotion. I was hugged by one man and it felt like I was being hugged by a beluga whale. I recall standing by watching in disbelief as bloke from my year morphed into his nineteen year old self and was trying to chat up one of the undergraduate girls. She was with her father who was at college the year after us. The room was full of beautiful girls who will forever be eighteen to me, now frayed and careworn but still with a twinkle in the eye. The conversations were the conversations left off. The jokes were the jokes of youth and for a brief moment I was back. One girl claimed that she was an O.F.U.C. that is …. Old, fat, ugly and cantankerous. She will never be old or ugly to me. I shed a tear when I was told that Colin was dead, the happiest of happy boys, dead to cancer before he was fifty and I felt a sense of loss for those old friends who were not there. The night went too quickly and I waited impatiently for the “Eagle Rock”, I was sure someone would hijack the DJ. The powers that be had got their way …almost. When the lights came up a dishevelled young cove with his jacket off and shirt-tails out, ran onto the dance floor screaming “No … IT HAS TO HAPPEN”. He dropped his pants started singing the lyrics. It was like a dust storm, one minute there was light and space, the next the dance floor was crowded with a very large number of middle aged men stumbling around in a circle with their trousers at different rates of drop. Soon there would have been sixty plus men in a circle arms locked with trousers around their ankles, resplendent in Down Trou pants (they had planned their wardrobe well as they knew what would inevitably happen) … pallid knees and thighs everywhere and the girls, God bless them, were in a circle behind singing to bring the house down … civil disobedience en masse or just a mob of naughty kids? Read pieces by Union College reprobate John Harms. Ah Lord M, great memories. I don’t remember who the first person to drop their duds to Eagle Rock was, but I do know that we worked out fairly quickly that wearing down trou usually got a laugh from security rather than an eviction from the function. We used to buy cheap material from Paddy’s markets and my Mum would make us matching down trou for big occasions (and sometimes bow ties and cumber-buns). Di Eales bought the Pig & I some matching red down trou for the reunion last year (as my 80 year old mother was too lousy to make them for us) and I subsequently forgot to wear them. I must be out of practice. I have seen the girls join in, my good friend Mary Mary O’Shea did an up-skirt at my wedding, with appropriate down trou beneath. Unfortunately there are no surviving photos to enter into evidence. I suspect Rol or Chooky Lomas as the instigators, they are ideas men. Thanks for the memories. In conclusion I only dream of fitting into those down trou in the photo these days. Brilliant Lord Mulcaster. Great days. That riff. Brings a huge smile every time I hear it. Will you be in Perth later in the week Lord M? 40,000 to link arms and sing “Eagle Rock” late Thursday evening. A regular tradition. Dropped trousers will reveal only red, white and blue boxers. Blame is not the verb I was thinking of PJ. That’s a cracker Mulcaster. Would love to see a video of the Down Trou circa ’82. Less complicated times. No doubt enough would feel offended these days to prevent this kind of spectacle from happening and that’s a shame! Was lucky enough to be able to support a mullet through the mid to late 80s. My old barber Nino knew: “Short on the sides, don’t touch the back eh?” Some classic cricketing mullets. Greg Ritchie had a beauty but I reckon Greg Campbell perfected the form during the 89 Ashes. Chicks have always participated in down trou-ing. Who provided the squealing? We did! We were always in the circle but kept our modesty. Until later. I’m wondering if the original unrefined effort was in the bunker. Both sets to the ankles and not a hint of brightly coloured curtain material! I. Lamb (Aust), are you angling for further story-telling? Great read – lots of memories! As an ex Jabber (St John’s alumnus) from the mid eighties this rings absolutely true, including John’s claiming ownership. It has been performed at every John’s wedding I ever went to, and pretty much for anyone whoever attended a UQ college in that era. Except maybe IH. Great yarn Mulcaster. The Eagle Rock tradition is held in great affection in South Australia, and many of us had speculated on its origins. It was well entrenched by the mid-1980’s, and my introduction to it, and early experiences of it were centred on the chaps from the Sem (Rocket, Stolly, D. Harms), so I suspect it was imported from Queensland by JTH. As our 21sts rolled around it was a compulsory component of the evening, although not met with universal approval in the somewhat conservative Barossa and its immediate fringes. A friend sent a message last week informing me that Hamish and Andy had a segment on it during their radio show, and some callers indicated that they recollected the Eagle Rock tradition from but a decade ago. I’ll send her the link to this story. Oslo Hoogen-Hargen, one thing I will lay claim to, is giving you that nickname . I also recall an article in the local rag a few years ago, stating that the down trou to Eagle Rock was being touted as a tradition that was born in the local nightclubs of Brisbane in the late 90’s or the the norties. Dr Rick / Stan the Man/ Myxo (pictured above) was so incensed, that he wrote a stinging letter to the Editor of the Sunday Mail, pretty much outlining the article above. I think there were a few other letters stating the same from former Union College residents of different generations. When I read Stan’s letter I just wished he hadn’t made those threats to the publishing house and signed my name instead of his. Anyway, we have all survived to continue the tradition. I’m loving the comments from Australia wide, keep them coming. Only came across your ‘Down trou’ missive today. I have a dim memory from my ’81 sojourn at Union of participating in a ‘chaps dance’ that went the full (or at least lower-half) monty!! Not sure of the venue but think it was a gate-crashed Emmanuel or Kings event. Obviously toned down by ’82 morphing into the ‘Down trou’! This is a story that, like the song itself, continues to give. While I don’t usually affix much to News Corp (se) reporting this would seem to align with the view commonly held on this site, which names the Uni of Queensland and Kapunda Footy Club as key protagonists.